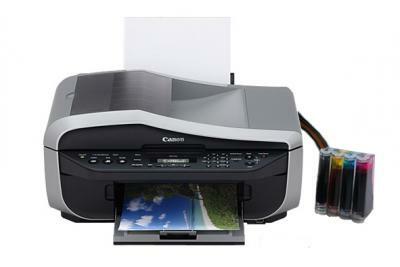 All-in-one Canon PIXMA MX310 with CISS - Inksystem - save money on ink! Buy All-in-one Canon PIXMA MX310 with CISS and make 30 times more quality prints for the same money! Pay only 0.04 USD for A-4 full color print! Digital Scan Resolution: Up to 19200 x 19200 dpi. Optical Scan Resolution: Up to 1200 x 2400 dots per inch. Format for printing material: Feeder: A4, B5, A5, Letter, Legal, Envelopes (DL size or Commercial 10), 10 x 15 cm, 10 x 18 cm, 13 x 18 cm, 20 x 25 cm, Credit Card (54 x 86 mm). Feeder: 64 - 105 g / m ² and supported Canon special media up to 273 g / m ². Photo speed: Printing "in the region" (borderless), 10 x 15 cm: approx. 46 seconds (standard). Color Print Speed: Text & Graphics: Up to 17 ppm (max. ), 9.1 ppm (standard mode). Print "in the region" (borderless): For formats A4, 20 x 25 cm, 13 x 18 cm, 10 x 18 cm, 10 x 15 cm and the format of a credit card).